Richard Sherman. . . .
I’m late. . . really late. . . I know. After all, it happened almost five days ago. In today’s world of speed, obsolescence, and everything from yesterday being “so yesterday,” I’m late in the game. I have to confess that I’m late in the game by design. The speed of the world can easily convince us that you need to speak and you need to speak NOW or what you say will be irrelevant. I’m learning that wisdom sometimes dictates taking time to ponder your thoughts for a good long time before they emerge into words. I’m a guy who needs to take Proverbs 29:20 to heart far more often than I do: “Do you see a man who speaks in haste? There is more hope for a fool than him.” The lesson is this. . . don’t say too much. . . and what you do say, don’t say it too fast. 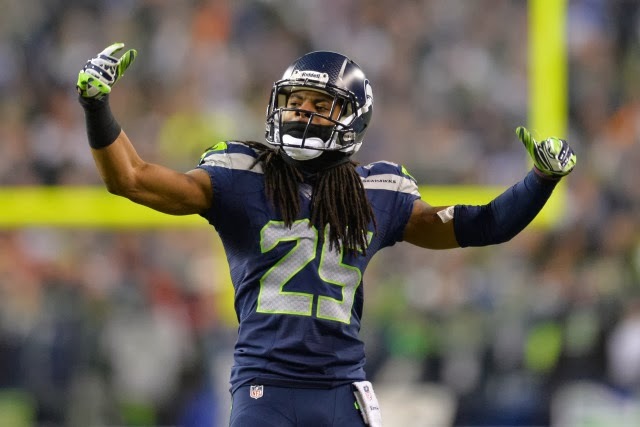 So, five days later I thought I’d share some very brief thoughts on Richard Sherman. . . this week’s most famous man in America. I think Richard Sherman is worth talking about. He’s put himself out there and now that he’s out there, we need to process him with each other and with our kids. So, here are some random thoughts on what happened five days ago, and the man that decided to make it happen. . .
We all have “filter problems.” Sadly, our culture increasingly tells us that we can run our mouths effectively without filters. That’s not a good thing. See Proverbs 29:20 (above). If our filters are non-existent, we should install them. If our filters are worn out or not working, we need to get to the filter store right away. Jesus said that it’s out of the overflow of the heart that the mouth speaks. What I say is who I am, whether I like it or not. If I say something that I wish I hadn’t of said or that I shouldn’t have said. . . well. . . I can’t fall back on “Hey, that’s not me. That’s not who I am.” That is me. I am the person who chose the words, made the decision to use the words, etc. What I say might be the best window into who I really am. Many bloggers, pundits, and commentators are wondering why such a big deal is being made about Richard Sherman, what he said, and how he said it. Well, fact is, we should expect better of ourselves and others. And if we don’t, we should. If I mess up, I need to apologize. I love the advice of Tony Dungy, who always expected the best from his players. When they didn’t deliver on that expectation, he told them to man up. . . no excuses, no explanations. That’s been good advice that each of us needs to follow. If you do something wrong, apologize. No excuses. No explanations. I’ve heard numerous folks say that we shouldn’t judge the real Richard Sherman by his behavior when he’s on the football field. That’s one of the most ludicrous statements I’ve ever heard. We aren’t – or at least shouldn’t be – compartmentalized beings. We must be consistent, integrated, and trust-worthy. In the wake of Richard Sherman’s words, someone posted these words from another player going to the Super Bowl, Peyton Manning. . . words that his father, Archie Manning pounded into him from the time he was young: “It takes 20 years to build a reputation, and five minutes to ruin it.” That’s good advice for all of us. By the way, “five minutes” is even pretty generous. “Hey kids. . . don’t ever be like that” are seven words that we as parents need to use on a regular basis. The Puritan Prayer book, The Valley of Vision, contains these words in the prayer entitled “True Religion”: “Preserve me from a false estimate of the whole or a part of my character; May I pay regard to my principles as well as my conduct, my motives as well as my actions.” That’s a prayer we all must pray. ← The Difficult Yet Necessary Work of Forgiveness. . . .
Hey Walt, long time no see. Thanks for your post. I have watched this Sherman thing unfold with interest. Everyone loves to suggest that we should excuse him because he is such a “bright, highly-educated, and generous” person. Since when does that excuse obnoxious behavior? If anything, it seems like that should make him more accountable. He should know better! The more I read and observe, the more it is apparent that he is presenting a very calculated persona to gain increased fame and attention. Quite successfully I might add … his jersey sales are now in the top ten of all NFL players. I find it all quite sad. Great perspective, Walt, and very convicting. As a type A and extrovert, I do blurt out things I wish I could take back so I understand it, but understand that my words only can be filtered when my heart is right with God. When I lose sight of that, or of Him, I venture into dark places. Thanks for the truism.